BJ and I started the day by heading out to an estate sale in Afton, MN. It felt like we were in the middle of nowhere, but were really only 38 minutes outside of the city. I was worried when Googi, what I affectionately call the Google robot inside my phone, took us off the freeway and onto a street. She has led us astray a few times, but this wasn't one of them thankfully. We were only slightly late for being early and got numbers 16 and 17. When they finally opened the doors for business, a few minutes late mind you- brrr, I elbowed my way through the crowd taking their shoes off (ugh!) to run to the garage, pushed past a lady who had no direction ahead of me, and promptly squealed with joy. It was mine! 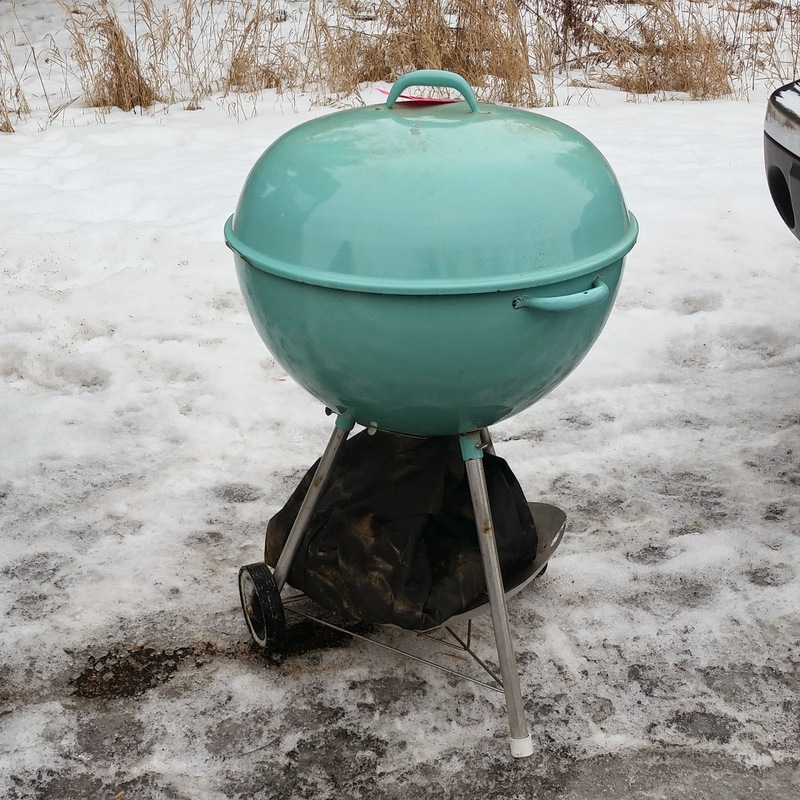 For only $15, BJ and I are the proud owners of a vintage turquoise Weber grill with cover, accessory attachment, a bag of something that can be set on fire, and some other grilling gizmo with which I'm unfamiliar! Woo-hoo! That's why we wake up early and stand in the freezing cold. Since we live in an apartment with a wooden balcony, we can't actually use this, but it will be waiting for us when we finally get a house. 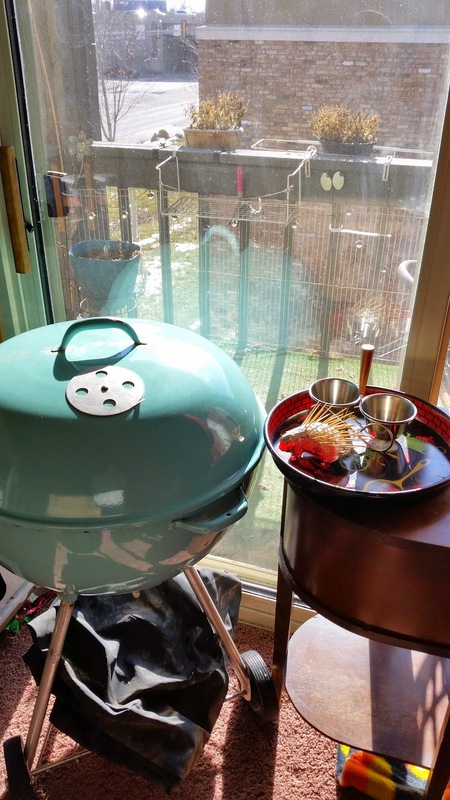 Not that fire code stops my neighbors from using non-electric grills on their wooden balconies and endangering the whole building... I'm seriously over living here. Let's rewind to Monday. I had my best day ever at the thrift store. To start, there were a handful of white cats waiting for me. Then I spotted a cast iron bear bank. He will be for sale at our booth at Auntie M's in Hopkins starting Sunday afternoon. I spent about 8 hours this week pricing everything. I can't wait to set up! Anyway, back to the thrift score. BJ walked up to me with the Fire King Blue Heaven utility dish and asked if it was worth buying. Um, yes! 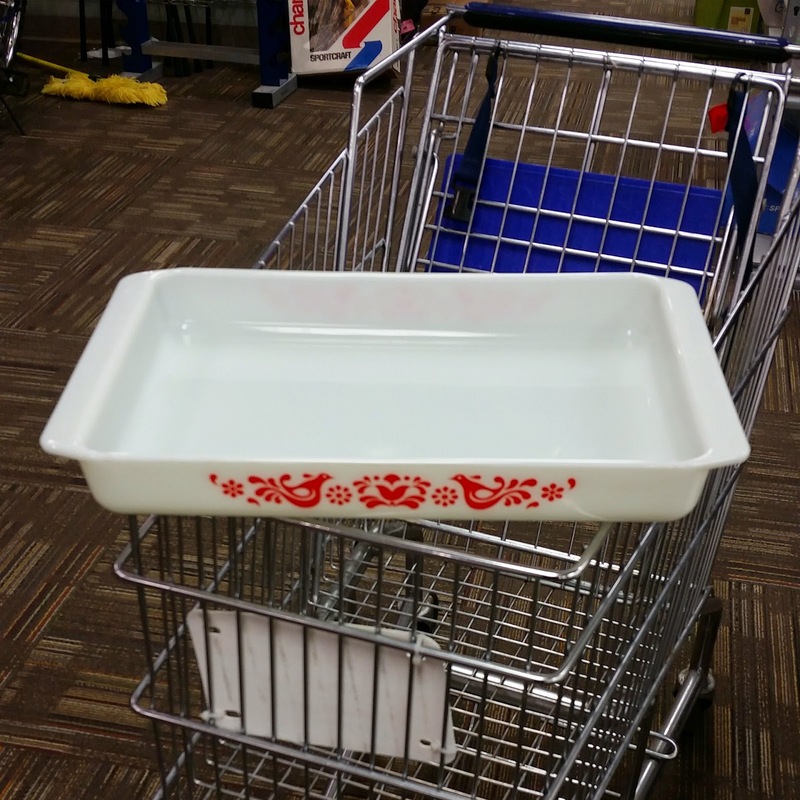 After looking through a couple more aisles, I went to the spot where the Pyrex usually is. BJ had already looked there, but since stuff is always being put out, and I generally have a better eye, I thought I'd take a pass through. I looked at a Glasbake dish, decided against it, looked at the lid bins and found nothing. Then I looked back at the Glasbake dish and setting next to it was a 045 black snowflake!!! My jaw dropped, my body flushed, I began sweating, and felt elated all over. When I saw BJ walking toward me across the store I violently waved at him then picked it up and shook it for emphasis. It was a good effing day. But it didn't end there. I was obviously feeling high off these great pick-ups and thought more would be even better. I headed over to the boxes of new stuff to be put out and found Fire King Jadeite. OMFG! Was this seriously happening to me?! Yes, yes it was. 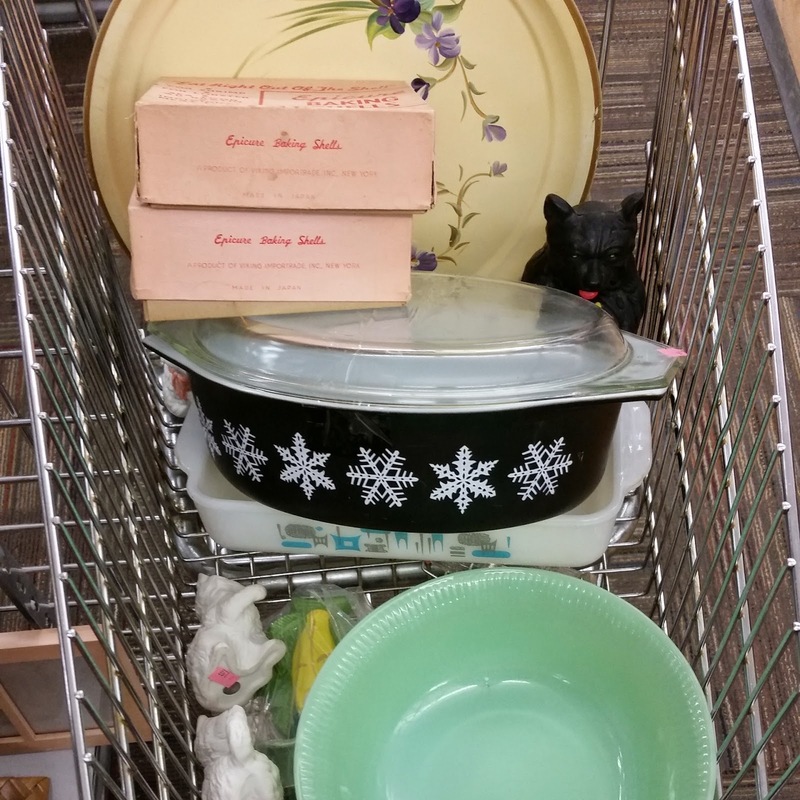 I also picked up a couple of NOS boxes of baking shells, and a vintage hand-painted tray. 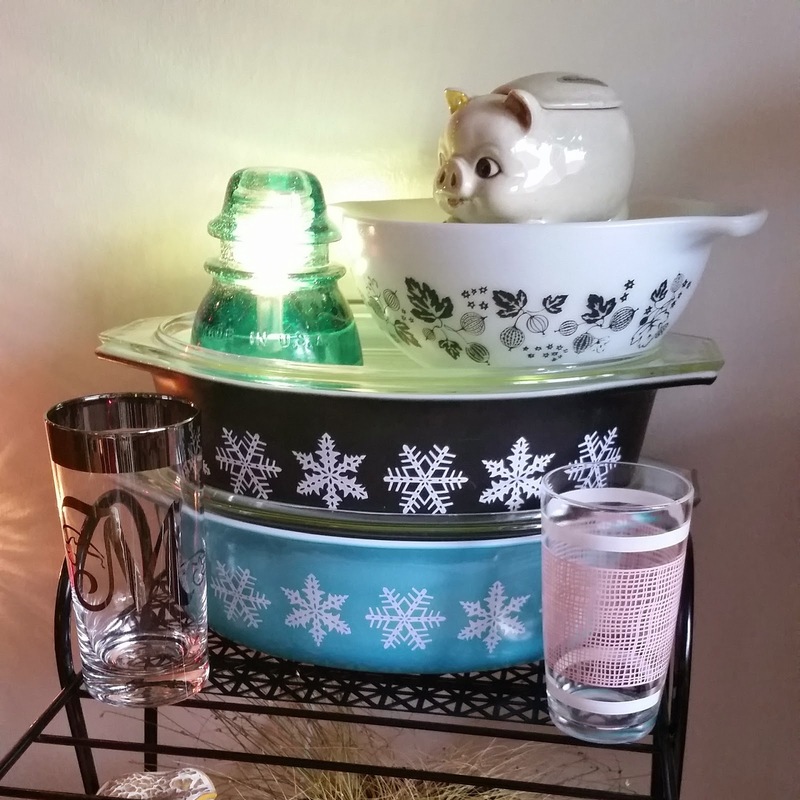 Most of Monday's finds will be at the shop, but I'm still trying to convince BJ that the jadeite should live with me and obviously the snowflake dish is MINE!!! I'm still excited about it. I finally gave up on my very, extremely dead rosemary tree and moved my kind-of-dead-with-a-new-bud-of-life pitcher plant into the window in hopes that it will grow. This display took their places. I picked up the insulator for really cheap at Arc's which was amazing because they usually price those like they are gold for some reason. FYI Arc's, they are common as hell and a thrift store shouldn't be charging more than an antique store- ever. I put a small light kit in it and it fits perfectly. BJ found the 'M' glass at Goodwill. The silver on it was really tarnished, but a warm bath brought it back to life. The pink cross-hatch glass was from Arc's out in Brooklyn Center which BJ actually saw and I didn't. Thank you! Please ignore the yellow fiber optic grass below. He's really trying to not be dead right now and wants spring to come soon. Despite the fact that I don't turn 'location' on, my phone still tracks my every move. It suggested to me that Arc's might be work and that it would take approximately 5 minutes to get there. Thanks, Googi. I guess it kind of is work, but it's strange that you suggested it. BJ and I went to 'work' after work and were insanely lucky enough to find a Friendship lasagna pan for only 6.50, but I had a $10 coupon that made it free so I also got a really cute and comfortable pair of mary-jane heels and a neat vintage bracelet with an inlaid design. 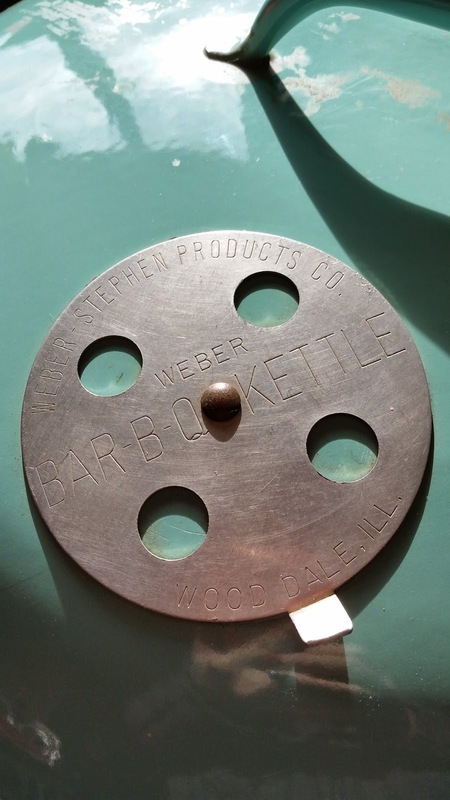 One of the very friendly workers also sold me on an aluminum tin that had the original lid. It wasn't a hard sell because I was actually thinking on the ride over about something I could use to store pre-made hashbrown patties in the freezer. Done! BJ had actually been trolling eBay and showed me a picture of this pan and I told him that I wanted one, but didn't want to pay for one. Quite serendipitous that we found one for cheap just days later! 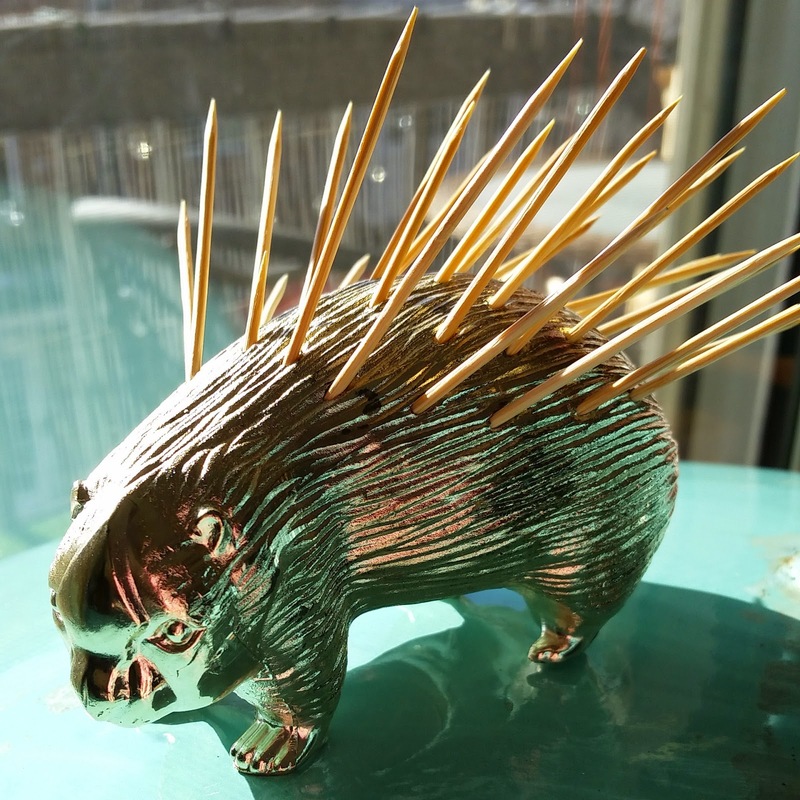 Last week, we made a late stop at the Goodwill in Bloomington where I found this Made in Japan porcupine toothpick holder, two adorable matching boy/girl crewel embroidery pictures, and the Alvin and the Chipmunks Christmas album! Now I really need a record player. I'll leave you with this image of hope for an early spring. Don't worry, I finally found everything I needed at Menards, including the first four seasons of Roseanne, so the revamp of the gossip desk is not far away. There is also something else fun I have planned that was actually the beginning of my very lucky Monday. Stay tuned! 2013. Manda Sisco. Watermark theme. Powered by Blogger.